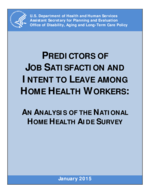 Most of the empirical research in the literature review examining job satisfaction and turnover intentions/turnover comes from nursing home studies with few that have looked at direct care workers across settings and fewer specifically examining the home care environment. While other factors also play a role, job satisfaction has been found to be a predictor of direct care workers’ intent to leave the job across long-term care settings (Sherman et al., 2008; Matthias & Benjamin, 2005; Decker, Harris-Kojetin, & Bercovitz, 2009; Castle, Degenholtz, & Rosen, 2006; Rosen, Stiehl, Mittal, & Leanna, 2011; Kiyak, Namaze, & Kahana, 1997; Castle, Engberg, Anderson, & Men, 2007). High turnover can have negative consequences for consumers and their families, employers, and policymakers. Workers who remain on the job may be more rushed because they are “working short” and, therefore, provide inadequate or unsafe care (Jobs with a Future Partnership, 2003; Dawson & Surpin, 2001). In addition, turnover and reduced availability of direct care staff make it difficult to provide continuity of care to clients. This lack of continuity disrupts the relationship building between the client and aides, an important contributor to quality of life for disabled individuals. It also limits the time for aides to understand clients’ needs and preferences (Wiener, Squillace, Anderson, & Khatutsky, 2009; Dawson & Surpin, 2001; Jobs with a Future Partnership, 2003; Butler, Wardamasky, & Brennan-Ing, 2012). Aides may be unable to adequately meet the needs of clients, resulting in poor nutrition, discomfort, secondary health conditions, and increased isolation (Kaye, Chapman, Newcomer, & Harrington, 2006). Clients may be turned away and denied access to care because there is not enough staff to meet the demand (Dawson & Surpin, 2001; Jobs with a Future Partnership, 2003). Worker shortages ultimately limit successful public policy implementation, as Medicare attempts to lower costs through the use of post-acute home health care and state Medicaid programs expand home and community-based services and attempt to integrate acute, primary, and long-term services and support for the dual-eligible population (those eligible for Medicare and Medicaid). Most of the empirical research examining the relationship between turnover and quality has been conducted in the nursing home setting. High turnover rates of certified nursing assistants have been associated with poorer quality care for nursing home residents (Bostick, Rantz, Flesner, & Riggs, 2006; Castle et al., 2006; Castle & Engberg, 2005; Mittal, Rosen, & Leana, 2009). Bostick and colleagues found that higher worker turnover rates in nursing homes were correlated with greater use of physical restraints, catheters, and psychoactive drugs, more contractures, pressure ulcers, and quality of care deficiencies. Barry, Brannon, and Mor (2005) found that nursing homes with low turnover and high retention rates experienced lower pressure ulcer incidence rates relative to nursing homes with high turnover and high retention rates. While there are no published studies examining the effects of HHA turnover or other workforce quality measures on client quality of care, studies have highlighted the important role that a positive relationship between the client and the aides plays in quality of life outcomes (Eustis, Kane, & Fisher, 1993; Rodat, 2010). Turnover also poses an economic burden on agencies and clients who hire their own home health workers. Stone (2004) cited Zahrt’s cost to replace home care workers. The total cost associated with each turnover was $3,362. This included the costs of recruiting, orienting, and training the new employee as well as the costs related to terminating the worker being replaced (e.g., exit interview, administrative functions, separation pay, unemployment taxes) (Zahrt, 1992 in Stone, 2004). Millions of dollars are spent on recruitment, orientation and training for new workers who then leave the job as well as hiring temporary, replacement workers to help agencies that are short-staffed (Mittal et al., 2009; Butler et al., 2012; Jobs with a Future Partnership, 2003; Dawson & Surpin, 2001; Wiener et al., 2009). Agencies also may experience loss in productivity, reduced morale, and increased stress among workers (Jobs with a Future Partnership, 2003). They can forgo income or lose income due to sales volume constricted by a lack of labor (Dawson & Surpin, 2001; Jobs with a Future Partnership, 2003). It is critical to address workforce retention because these problems will probably be exacerbated in the future. The home health and home care industry is the fastest growing sector of the American economy. The number of home health worker jobs is projected to grow by 50 percent between 2012 and 2022, at rates four or five times that of jobs overall in the economy (BLS, 2012; Seavey & Marquand, 2011; PHI, 2014). The number of home health workers needed to meet demand is over 1.3 million by 2020 (PHI, 2013). Understanding the determinants of turnover will help policymakers, agencies, workers, clients, and their families to modify, to the extent possible, specific policy-level, workplace-level, and worker-level factors that will support a more stable, quality home health workforce.